Jasper Morrison has added a new model to the HAL chair family: the HAL Armchair. Based on the HAL seat shell, he developed an organic one-piece shell that takes on a distinctive look of its own with the curved armrests growing out from the sides - while still bearing a clear family resemblance to the rest of the line. 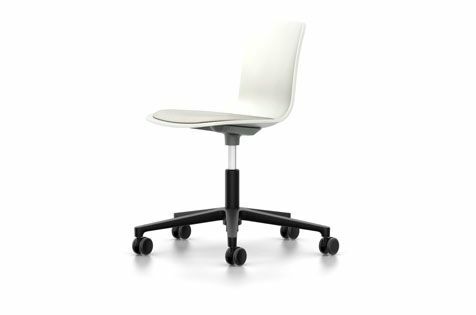 The shell construction responds to the physical forces operating on the seat and provides maximum stability and superb comfort with a minimum amount of material. This comfort is enhanced even further in the versions with a seat cushion.For the base, there is a choice of four-legged bases in tubular steel or wood as well as a five-star base on castors. Thanks to the openings under the armrests, HAL Armchairs with a tubular steel base can be stacked (but only in the version without a seat cushion).The HAL Tube stackable armchair with a white plastic shell and limited edition ivory base is part of the "White Collection" and "Home Stories for Spring 2016". Five-star base in die-cast aluminium powder-coated in basic dark. Swivel mechanism with shock-absorbing seat suspension, height-adjustable. Colour matched to the small attachment parts for the seat shell, choice of white or basic dark. All bases fitted with glides for carpet; felt glides optionally availableÂ forÂ hardÂ floors.